When I made this recipe recently, I actually wasn't so sure I wanted to try it. Caramelized pecans and apples seem so autumn-centric to me...and I'm in full-time spring mode lately. However, when spring comes, I tend to eat much lighter, skipping the "entrée" and eating the salads and side dishes as main meals. 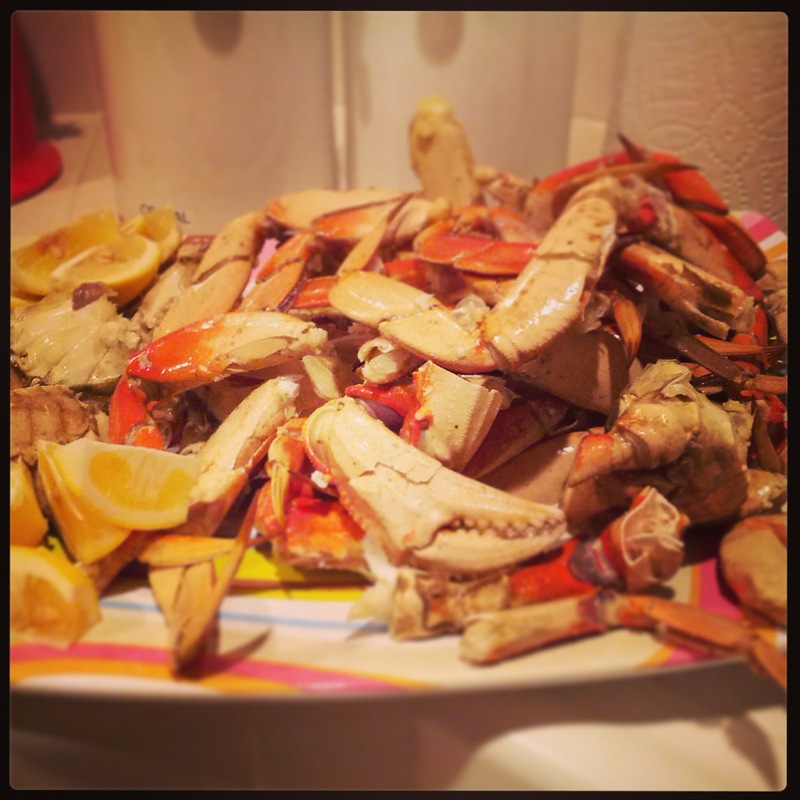 So this recipe actually began to seem just right for how I like to eat in April. I found this salad in a Donna Hay magazine quite some time ago; after scouring her website, I can't find the issue number anywhere so, alas, no direct link - I've looked all over the web. But I didn't change anything - the recipe I'm sharing here is hers exactly. Lastly, apologies for the photos, which were taken with my phone. That said...not bad for my phone, right? Preheat oven to 325 F (160 C). Place the prosciutto on a baking sheet lined with parchment paper, brush with maple syrup, and bake for 10 minutes or until crisp and golden. Set aside. Place the pecans, sugar, water, and salt in a bowl and toss to coat. Heat a large non-stick frying pan over medium heat. Add the pecans and cook for 6-8 minutes, stirring occasionally or until caramelized. Set aside to cool. Place the vinegar and oil in a bowl and whisk to combine. 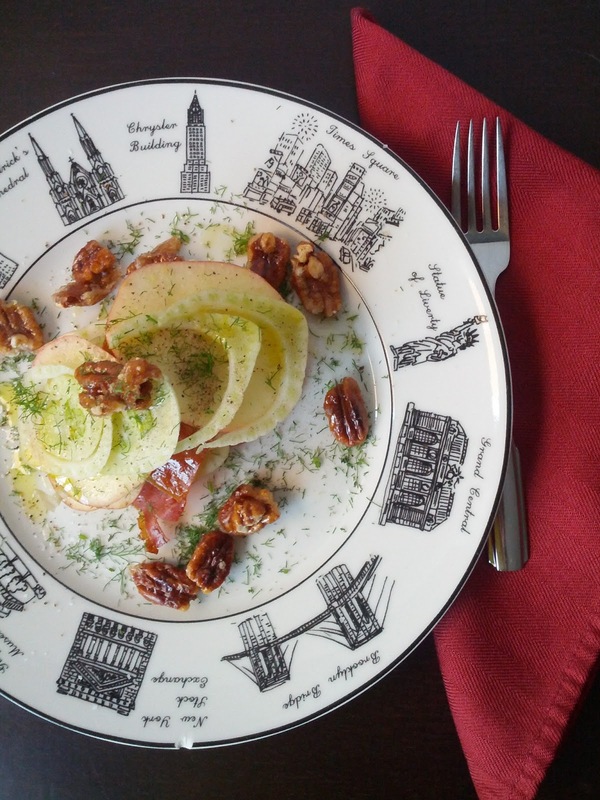 Place the apple, fennel, prosciutto, and pecans in a bowl, drizzle with the dressing, and toss to coat. NOTE: For presentation, I layered it. 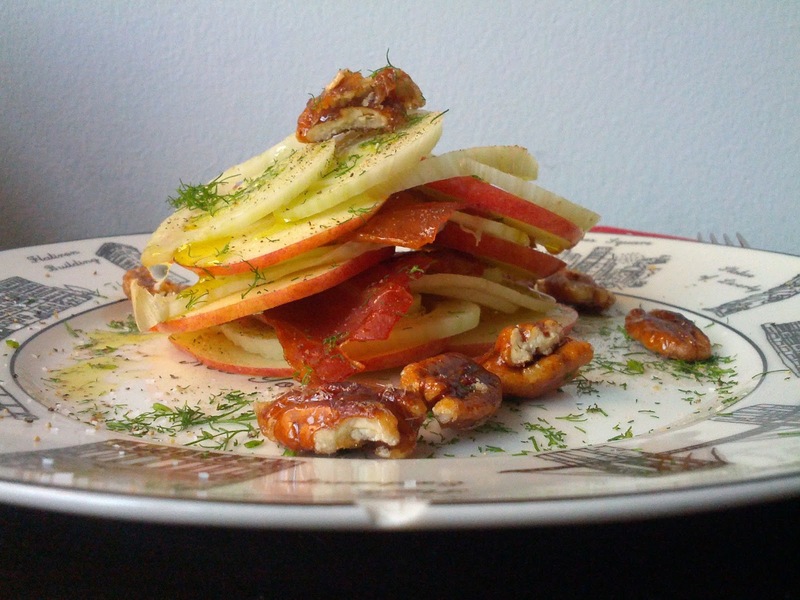 Stack the apple slices, prosciutto, fennel; start again. Add pecans on top and around plate as garnish. I also saved some of the fennel fronds, chopped them, and sprinkled them on top last. Finish with a fresh grind of pepper. Eat, drink, and embrace lightness. 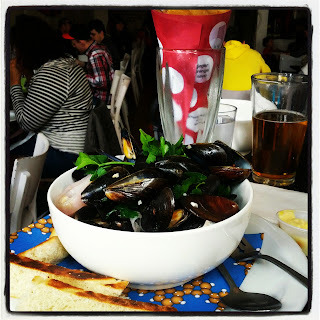 Arles mussels (shallots, butter, parsley, garlic, white wine), frites with lemon-saffron aioli, and a pint of Leffe at Frjtes. 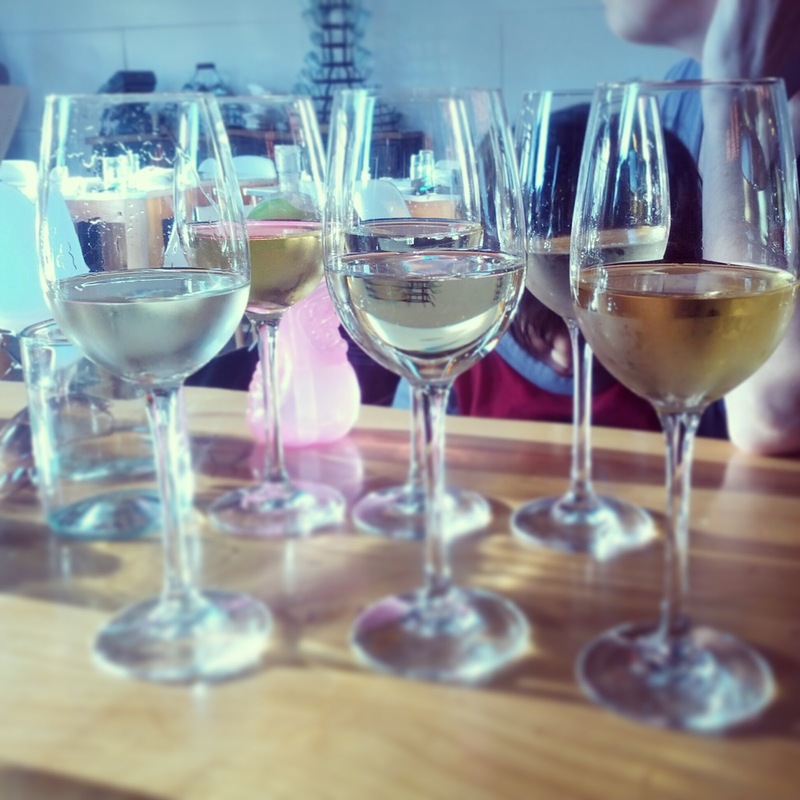 Flight of "spring whites" at Toast (yes, that's a sippy cup in the background...). 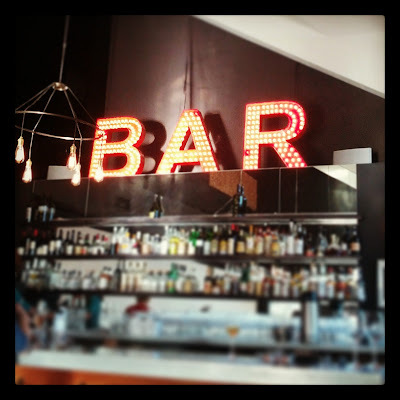 The bar at Toast - can I keep this sign? 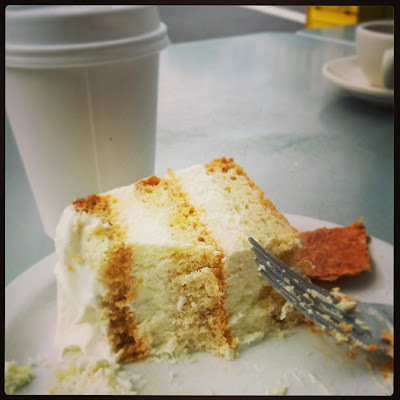 Tres leches cake from Tartine Bakery. I have a nonexistent sweet tooth and I still polished my plate. DELICIOUS. 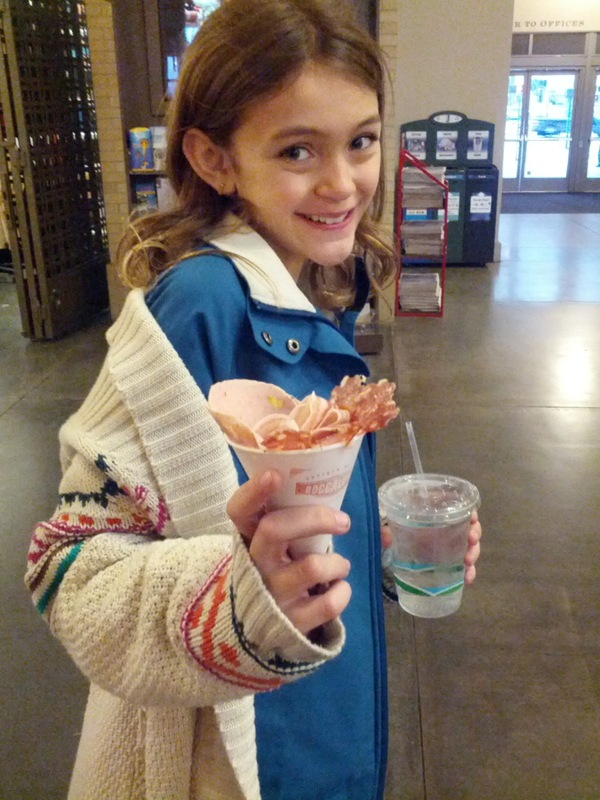 Bug with her cone of meat from Boccalone Salumeria in the Ferry Building (she chose mortadella, soppressata, and pancetta). I also couldn't resist buying their orange-and-fennel salami...as well as their brown-sugar-and-fennel salami! Outstanding last supper at Chez Amy and Lisa. I can hardly complain about this winter so far; other than a freezing cold that has gripped the Northeast, New York has had little snow or rain to mention. Nevertheless, I feel like I would give damn-near anything for a peach straight from the farm right now. Don't we all feel that way this time of year? So, as you can imagine, I struggle with my menu in February. No more potatoes! No more soups! No more root vegetables at all! Even...dare I say it?...no more Brussels sprouts!!!! But how do I freshen up my dishes without buying, say, asparagus that's completely out of season? When I saw a recipe for Egg Noodles with Creamy Red Cabbage and Sweet Corn in my Edible Brooklyn: The Cookbook (from the Edible Brooklyn magazine folks), I thought it would be perfect. And what an interesting combination with pasta, right? Actually, this whole cookbook is amazing; it's quickly becoming one of my go-to books. Anyway, it's obviously not corn season in New York right now but I have no problem substituting with frozen corn in the winter months - frozen in the off-season is much better than fresh in the off-season, to my mind. This recipe is, in a word, fantastic. It mixes the sweet with the salty, and the red wine vinegar rounds it all out with a tart acidity. The pasta gives the dish a heartiness you want in winter, but the corn is such a welcome change from the usual cold-weather fare. To quote Adam, "this recipe's a keeper." 1. Heat the olive oil in a large saucepan over medium heat. Add the onion and garlic, and cook for a few minutes until the onion is softened but the garlic is not yet golden. 2. Add the cabbage and salt, and cook for 3-4 minutes; do not let the vegetables brown. Add the vinegar and sugar, cover the pot, reduce to a gentle simmer, and cook for 30-45 minutes, stirring occasionally. Taste the cabbage - it should be tender but not mushy. Adjust the salt, vinegar, and sugar to taste if needed, and set the cabbage aside. 3. In a large skillet, melt the butter and sauté the corn over high heat until it begins to caramelize. Remove from heat and set aside. 4. Cook the pasta according to package directions (about 3 minutes for fresh pasta), reserve 1 cup of the pasta water, and drain. In a large bowl, combine the pasta, corn, red cabbage, and crème fraîche. Thin sauce with pasta water, if needed. Let sit for 3-5 mintues to allow the pasta to soak up the sauce. Serve in warmed bowls. Top with pepper to taste. KID-FRIENDLINESS NOTE: This dish is fairly adaptable for kids. I reserved some corn and pasta in a bowl, tossed them with some crème fraîche, and Bug was perfectly happy to eat it. She probably would have gone for the cabbage as well but, with the onions in there, she would have been scared off so I left those out of her bowl. NOTE: The cookbook was given to me by the publisher. This will absolutely be a recurring dish in our house. In addition, to the unique mix of flavors, the colors are simple gorgeous - a sure way to cheer you up on a dreary winter evening.